As you’ve heard on the news, mortgage and interest rates have fallen to record lows over the last few weeks. The ongoing debt crisis in Europe, coupled with the slowing U.S. economy, has contributed to these extremely low mortgage rates. I purchased a home 2 years ago, at a fixed rate of 4.375% for 30 years. This was a great rate at the time. However, times have changed, and rates are currently at the lowest they have ever been since long-term mortgages began in the 1950s. A colleague of mine recently refinanced his mortgage through Cash Call Mortgage division and shared with me how quick and easy his process was. He referred me to the loan officer who handled his case. Cash Call. I know what you’re thinking. This is the company that used to use Gary Coleman has it’s spokesperson. That was for the personal loans division of the company, which if you search, has terrible reviews. I have no experience with Cash Call personal loans. Today I will share my experience with the Cash Call Mortgage division, which has very positive reviews online. I emailed my mortgage loan originator at Cash Call on July 22nd to ask questions about refinancing my home. These quotes were based on a loan value of 75% or less with credit score of 740. And as I’ve shared before, my credit score is awesome. The best part of working with Cash Call is that all of their loans have no closing costs, no prepayment penalty, no points, no appraisal fee, no escrow fees and no filing fees. Cash Call will match or beat any policy if a good faith estimate is provided from another lender. I was told that if interest rates drop within 30 days, the loan document would be re-written with the lower rate. My credit score was calculated after a hard pull of all 3 credit bureaus (Transunion, Experian, Equifax) with the average score used. I had to fax or email proof of the above items. On July 27th, Cash Call sent an appraiser was sent to my home and completed the appraisal within 2 days. They covered the appraiser fee, which was $340. On July 30th, I was approved for a lock in mortgage refinance rate of 2.875% for 15 years. I was extremely excited to shave off 13 years of my mortgage with this refinance, and save over $200,000 in interest payments. On August 2, a notary came to my home to have me sign the final paperwork to get my loan processed and funded. Two days later on August 4th, I began having second doubts. I was in a haste to refinance at the lowest possible rate ever. Sure, with dual income, we could afford to make an extra ~$690 a month to completely pay off the mortgage in 15 years. I quickly emailed my loan processor and asked if I could change my 15 year loan to a 20 year fixed loan at 3.50%. Within hours, I received a response telling me it would be no problem to get a rate change. They were able to quickly get my loan re-locked and re-disclosed by August 8th. After the 3 day grace period after re-disclosure, Cash Call sent a notary to my office again to re-sign the final paperwork on August 9th. On August 10th, they sent me a prepaid Fedex envelope so that I could pay off the prepayment interest on my old mortgage. My mortgage refinance was approved by the underwriters yesterday and today I just found out that my loan has been fully funded! Deciding whether to refinance a mortgage is all about numbers. Refinancing can give you a lower monthly payment, shorten the length of your current mortgage, or both. You can use the refinance calculator at bankrate to help aid your decision. In my case, I did not want to extend my mortgage back to a 30 year term. My goal was to get a reasonable lower interest rate and shave off several years of my mortgage together. My refinance will increase my monthly mortgage payment by $265 a month. The trade off is that I will shave off 8 years from my mortgage, and save over $140,000 in interest payments over the lifetime of the loan! EDIT: I've been told that Cash Call usually resells mortgage loans to Wells Fargo Bank or Citibank Mortgage. I'll update the post to reflect which lender they sell my loan to. I hope it's CitiMortgage, since I've been with them before. I couldn't have done this without having a good credit score. As i've said before, a good credit score is one of the most important things to have in life. 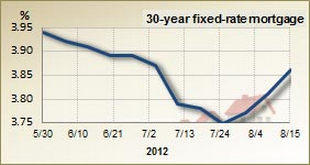 Checking bankrate.com, it seems like mortgage rates may be slowly creeping up. The lowest point so far was on July 24, 2012. Luckily for us, this period coincided exactly with my mortgage refinance. That being said, according to bankrate, it’s still a good time to consider refinancing. I just wanted to give a big thumbs up to Cash Call and my experience with them. It has been an wonderfully smooth process from start to finish. My loan processor has been extremely attentive to all of my needs. He addressed every single one of my questions quickly and clearly through emails and phone calls throughout the quick process. The best part of working with Cash Call Mortgage was that I was able to get a great rate and close on the loan extremely fast without any hidden fees or costs. I'm a satisfied client and would not hesitate to refer my friends, colleagues and family to Cash Call for their mortgage and lending needs. Ditto for me.. Fantastic experience with Cashcall Mortgage. It was the 10th day after application/15-day rate lock, and couldn't believe ourselves when the loan processor called me that morning and asked if we could sign the documents at 4pm or 6 pm today!!!!!!!!! WHAT????? I thought she was calling me to say "the underwriter wants 5 more documents, blah blah".. the loan funded on the 14th day after application. I can't talk for everyone, but we are incredibly happy with Cashcall. Folks, this is one mortgage lender who knows to make money and move on, and in the process do some good to people like us as well.. what more can you ask for in a refi?